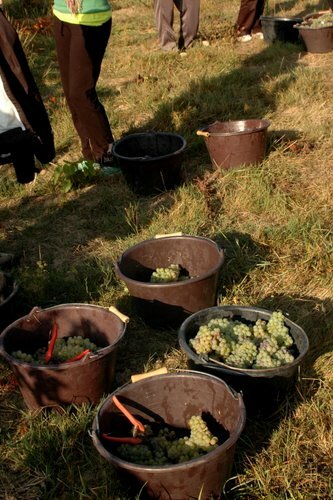 Pears in red wine and a wine harvest. Pears in red wine. Always a winner in our house during the winter and especially over the festive season. In this recipe I used a cabernet sauvignon, but I have also used a (moelleux) sweet white wine before like a Montlouis moelleux or a semi sweet, which is just as delicious. 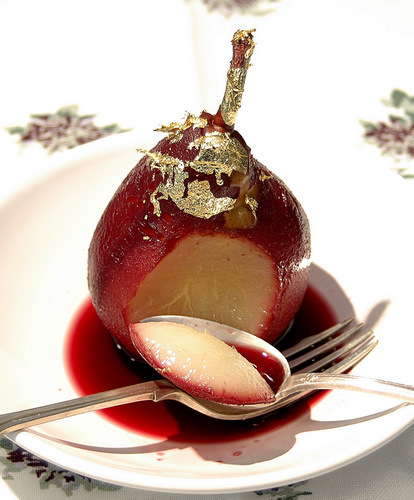 Decorate the pears in red wine with some edible gold leaf and the pears in white wine with spun sugar. A post on how to make spun sugar will follow soon – before Christmas! 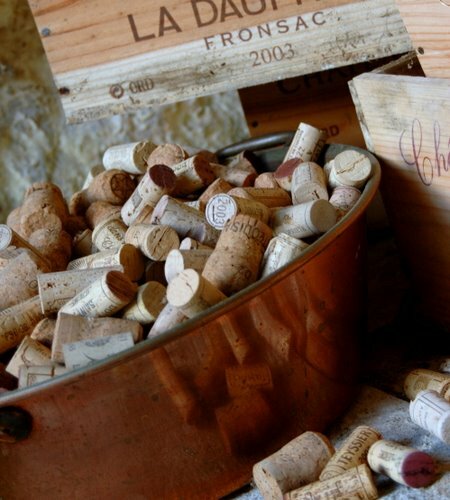 Why not gather all your wine corks and display them in pretty empty containers somewhere. 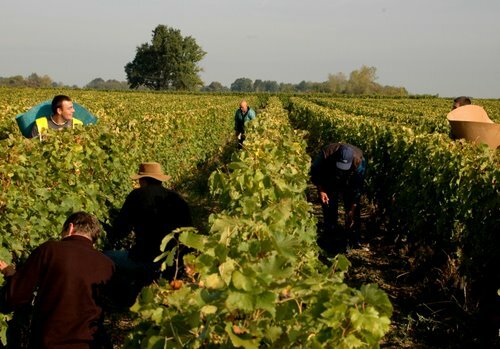 Always a good talking point and especially the men like to dig and see the wines that passed through. 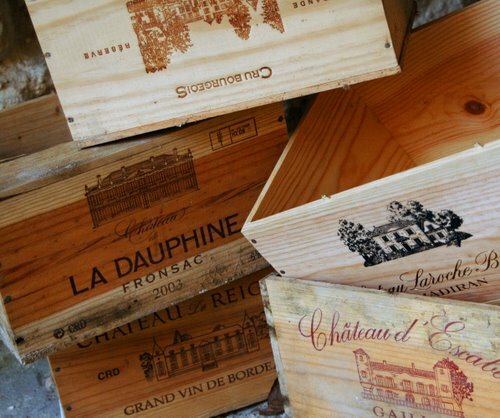 I also colletct the wine cases, hoping I can get hold of enough to convert them into drawers and kitchen tops and units for Coin Perdu, our house in Corréze. 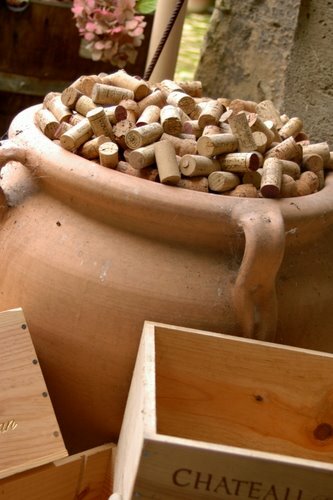 They also make nice storage space in the pantry, can be used in the wine “cave”, the cats sleep in the empty ones and some even carry small twigs for lighting fires in my atelier. 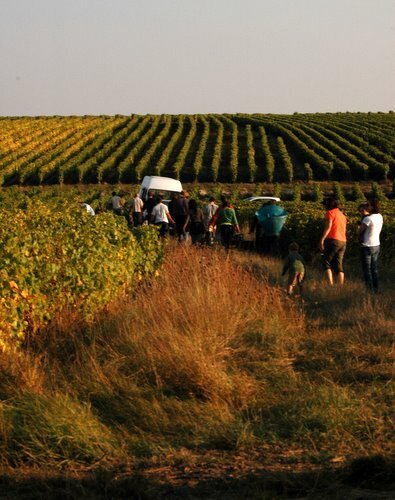 In October we had one day of grape picking at the vinyeards of our friends Vincent and Tania Careme. 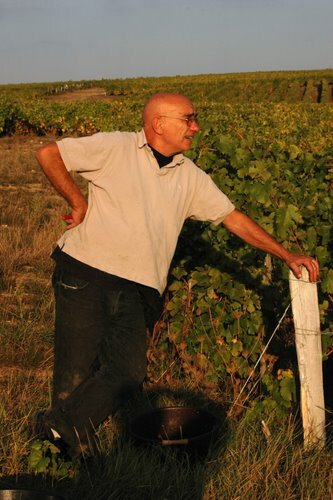 The domaine vincent Careme is a bio vinyeard where no chemicals are used, wild herbs and weeds are allowed to proliferate, adding to the health of the grapes and picking is still done by hand. 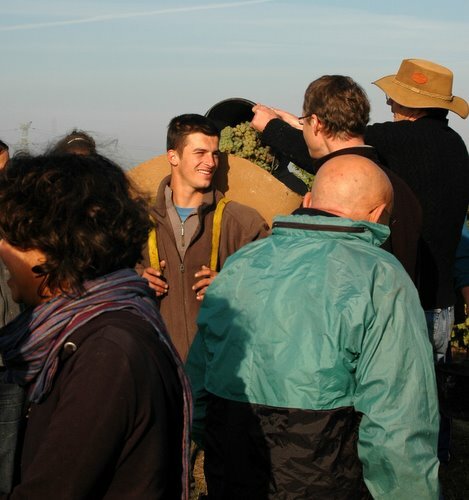 They have a traditional Saturday during grape harvesting in Octobre, when all their friends and family get togetherfor a day of grape picking, press the grapes, feasting on a huge lunch, continue picking afterwards, pressing again and finishing off with some more eating. 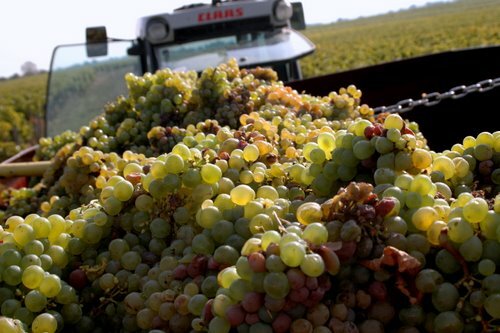 We were all dead tired, but what fun we had, one of which was a grape fight when everybody started getting tired and sticky towards the evening. 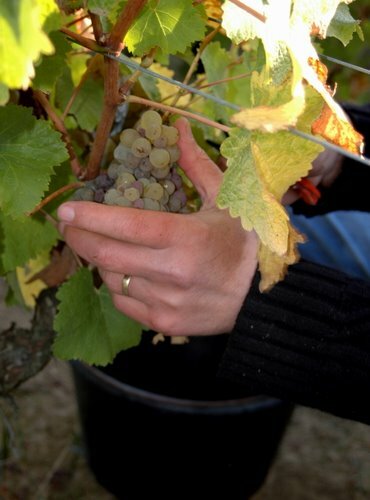 Here are some pictures of the Saturday at Domaine Vincent Careme. 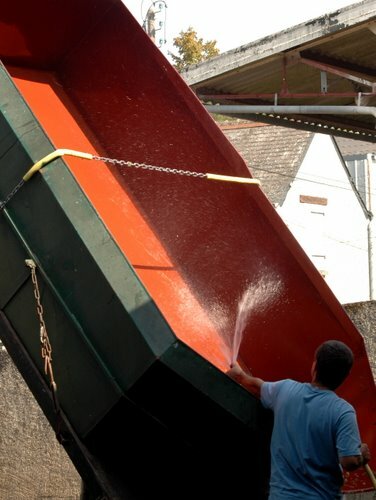 Soon to be followed: More about the wines of Vincent and Tania, their wine cellar in the typical “caves” of Touraine, a sculpteur doing his artwork in one of their caves and the many pleasure(and hard work) of daily life at Domaine Vincent Careme. Next Article Stuffed cornes de boeuf peppers and a book on food and painting. 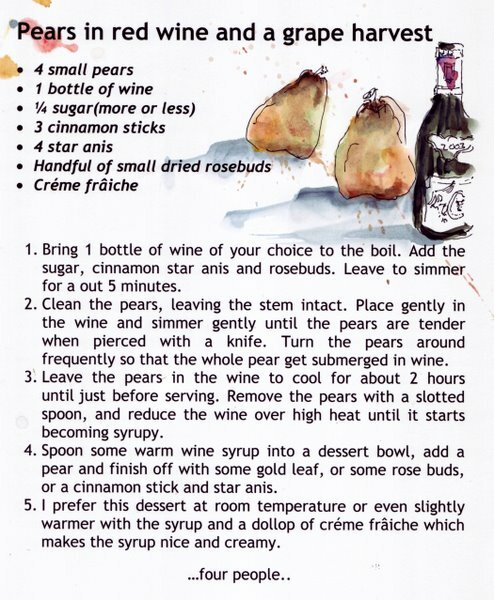 I love poached pears, never done with red wine that is in my list now. 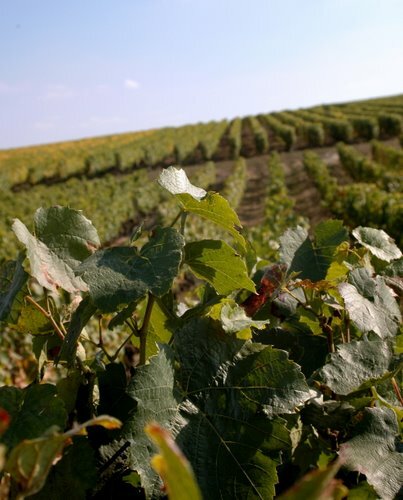 Yourlook so beautiful, i have always wanted to go to a wine yard. Chanceuse!! I can imagine that being a best of best days.. happy tired as a friend once quoted..then a celebration.. Your photos are beautiful..the stance in “fatigué” is spot on caught.. THis is the second time edible gold leaf has had such an impact on me..I will have to look for some.. Your Pears in Red wine looks delectable. I love the gold leaf! That pear is so elegant! 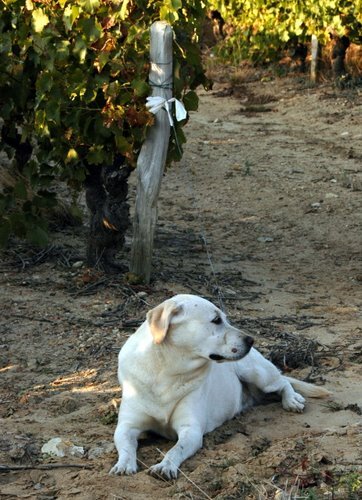 It must have been great time on the wine yard! The gold leaf makes this dessert fit for a banquet. It is beautiful, Ronelle!!!! Beautiful pears! That’s an elegant and delicious dessert. 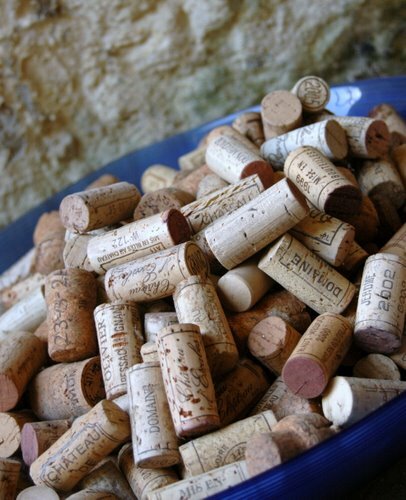 I save wine corks too. They’re spilling out of several vases and bowls in my house. Gold leaf…now that’s something to try. Last time I poached pears I think I grated fresh nutmeg just before serving. 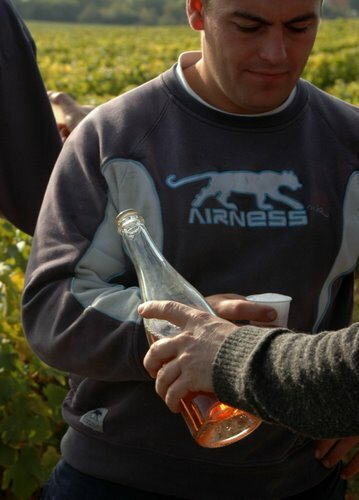 And I love the vendange! 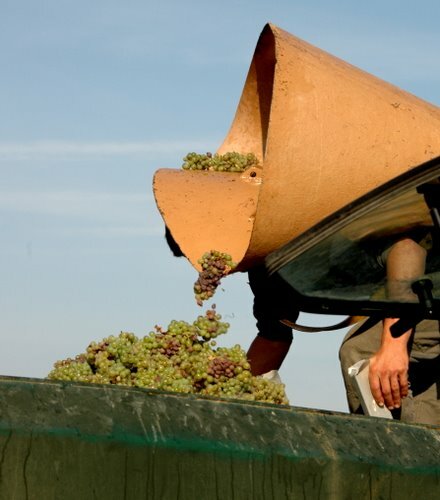 One of the jobs I loved best was working in a vineyard. The pears look so festive and delicious and I have decided that i will be be serving them as my Christmas Eve supper dessert. 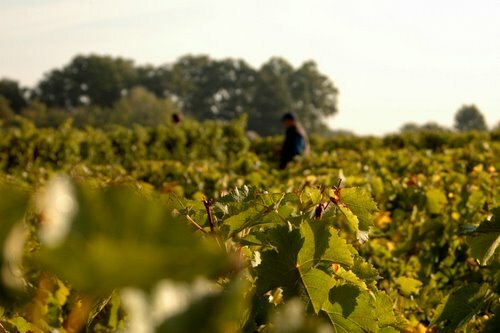 The day at th vinyard looked exhilirating, what more can you ask for, fresh air, hard work, good friends, good food, a lovely life. 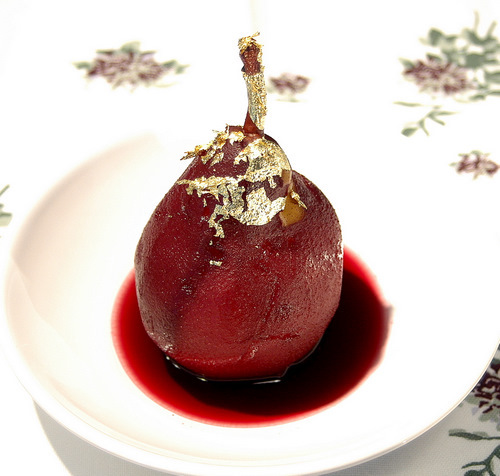 I love the look of those pears especially with the gold leaf. 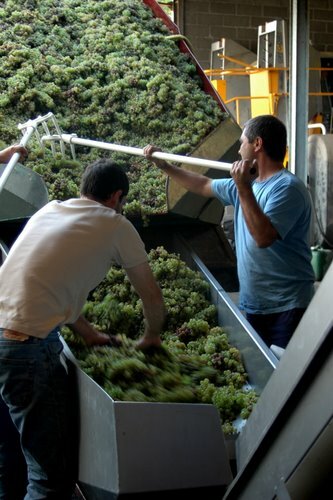 The grape harvesting looks like so much fun, would love to participate one day! I LOVE your site! Your recipes sound delicious and the photos are beautiful. My boyfriend is French (Bayonne) and I enjoy learning about French cooking. I can’t wait to try this recipe since I have a few pears just sitting around the kitchen. Thanks for sharing and looking forward to following your cuisine!